Oton is not like other towns that are ALWAYS flooded. This situation may not be applicable as we speak, we MUST do something! Mayor Vicente B. Flores Jr. presented this problem during the Mayor’s meeting of Metro Iloilo-Guimaras Economic Development Council (MIGEDC) chaired by Mayor Jed Patrick Mabilog, who is also the Chairman of the Iloilo River Development Council (IRDC). 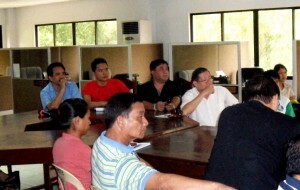 The said meeting was attended by Senator Franklin Drilon. The short presentation highlighted the many potentials of BATIANO RIVER for Disaster Risk Reduction, Socio Economic Development, Tourism and Heritage. Fortunately, he was able to get the support of the good senator who is also very serious in rehabilitating Iloilo River. During the same meeting, Mayor Flores manifested his interest to become a member of the IRDC after the Department of Environment and Natural Resources presented its survey of the Iloilo River stretching to Oton. His manifestation was gladly accepted by the council and he eventually discussed the good news in a pre-summit meeting with us. NOW, this October 2011, after decades of flood, we hope that we can solve or mitigate such problem as we begin with the BATIANO RIVER SUMMIT!